Party Your Way Into Fitness at Club Ritmo! 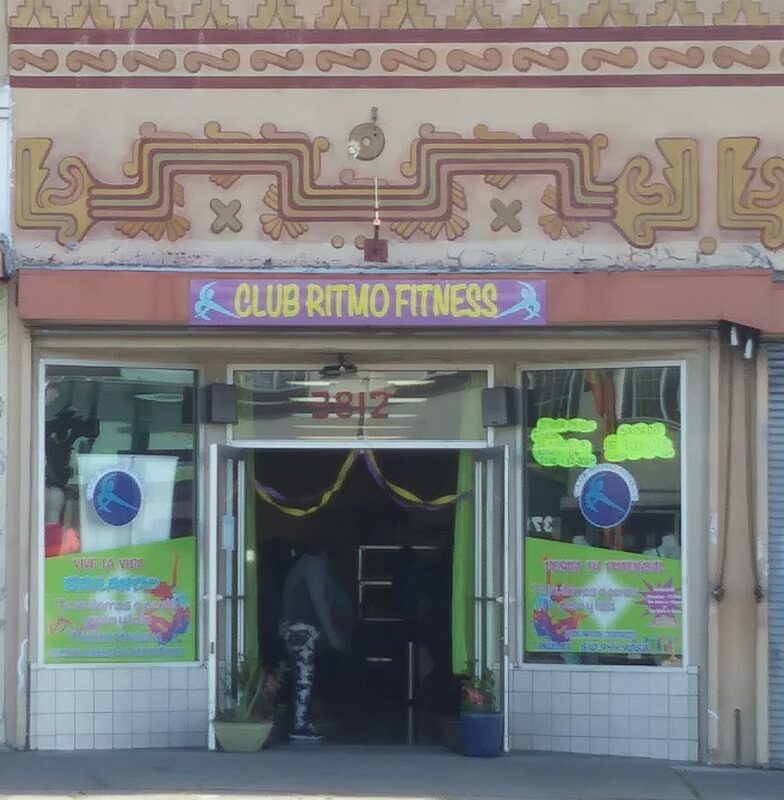 Club Ritmo Fitness is located a few blocks from the Fruitvale BART station. From the Number 1 bus that runs up and down International Boulevard, it’s the stop just before or after the BART Station, depending on which direction you’re traveling from. It’s in the Fruitvale District, a busy business and residential location in East Oakland. The actual address is 3812 International Boulevard, Oakland, California 94601. 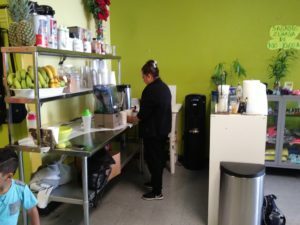 There’s heavy foot and auto traffic and it is surrounded by retail businesses, restaurants, doctors’ offices, community centers and a school, run by and patronized by mostly Asians and Latinos. Most of the time, the Fruitvale District is light and bright, even on cloudy days. Every time I’ve passed by Club Ritmo Fitness, it’s hard not to notice them with their blazingly loud music. With the doors wide open, it looks exciting with women of all ages and sizes dancing sexily to the fast beat of salsa and salsa-like music. I appreciate the fitness, fun, music and camaraderie it appears to offer. From outside, Club Ritmo Fitness appears to be a big dance studio room, well-lit, with light-colored walls and flooring. To the right of the entrance is a large mirrored wall with a ballet barre. The instructor stands with her back to the mirror facing the dancers. They perform the routine in leggings and body-fitting shirts, energetically, and in unison. They only accept cash; scholarships, sliding- scale fees and monthly payments aren’t an option. The classes are $5 per class, with the first class free. It costs $6 with tea or $8 with a protein shake that’s considered a meal replacement. Fresh water and fruit are also available. There are no contracts or paperwork to sign. The classes are offered twice in the mornings from 9-10 and 10-11, and twice in the evenings from 6-7 and 7-8, Monday through Friday. There is only one class in the morning on Saturdays, from 9-10. These are the only times the studio is available to its customers. Club Ritmo’s only online presence is on facebook, https://www.facebook.com/RitmoFITNESS38, the phone number listed is wrong and you can’t message them. They have 49 followers and a Facebook group with one member. Angelica anticipates a website in the future. From the youtube pages of other national Club Ritmo locations, I discovered they’re executing Zumba! 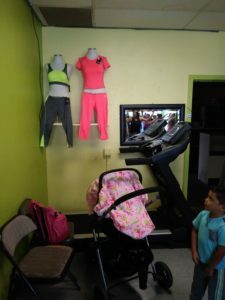 A short tour of Club Ritmo Fitness revealed a medium- sized dance floor, a small counter area to the right in the back and a door with a rack for hanging personal items behind it. Across from the door is where the treadmills sit in the corner. There’s a parking lot in the back shared with other merchants; patrons have to walk to the front to enter the establishment. 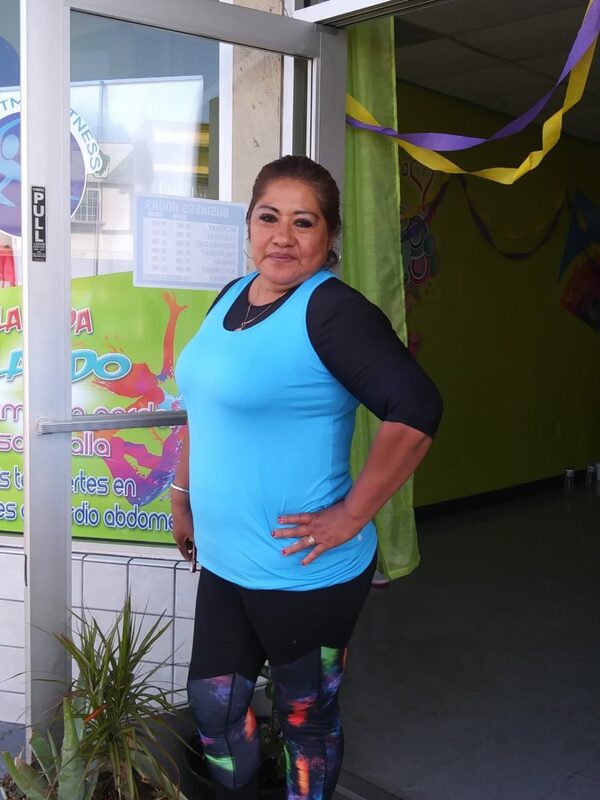 Angelica, owner of Club Ritmo Fitness is really so fit! I like your blog!